iOS 11.1.2 Jailbreak Exploit to be Released! This may be Beer’s day job, working with security and finding these types of vulnerabilities, but at no point has he ever stipulated that he is working on a jailbreak release which utilizes his findings. His tweet suggests that anyone who is interested in “bootstrapping iOS 11 kernel security research” should prepare themselves a “research-only device on iOS 11.1.2 or below”. He then goes on to mention that the “Part 1 (tfp0)” release will be coming soon. 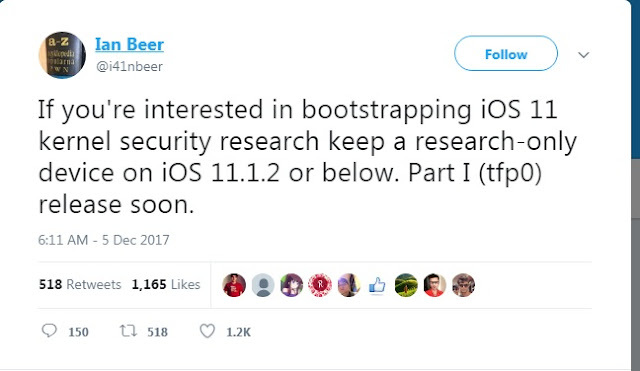 Beer is already well-known and respected in the security world thanks to his work with Google and the Project Zero team, but his name is fast becoming famous in the jailbreak world after discovering multiple security vulnerabilities in iOS and macOS, which has previously forced Apple to rewrite parts of the kernel belonging to those platforms. This latest discovery could be one of the biggest parts of the jigsaw for a modern jailbreak for compatible devices. It’s worth mentioning that this discovery and potential release is not a fully working and functional jailbreak that will liberate compatible devices running iOS 11.1.2 or below. Instead, this is what is being defined as a tfp0 exploit which essentially allows those with the necessary skillsets and knowledge of Apple’s iOS platform to run unsigned and unofficial code at the kernel level. This is basically the highest level of privilege possible, meaning, that in the right hands, and with right exploits such as Luca Todesco’s yalu102 KPP bypass, this could be a significant part of putting a jailbreak together for iOS 11 (iOS 11.0-11.1.2).